I had a hard time realizing that my experience of building a mountain bike was coming to an end. At the start, I just had a black frame on on PCS-9 workstand, parts at my cousin's house, cables from a bike shop in Wallingford, a rear fender from Greenwich Bicycles, a seat and seatpost from my folding bike and five or six separate packages from online sources scattered all over the shop. But once I was nearing completion, all I had was this. 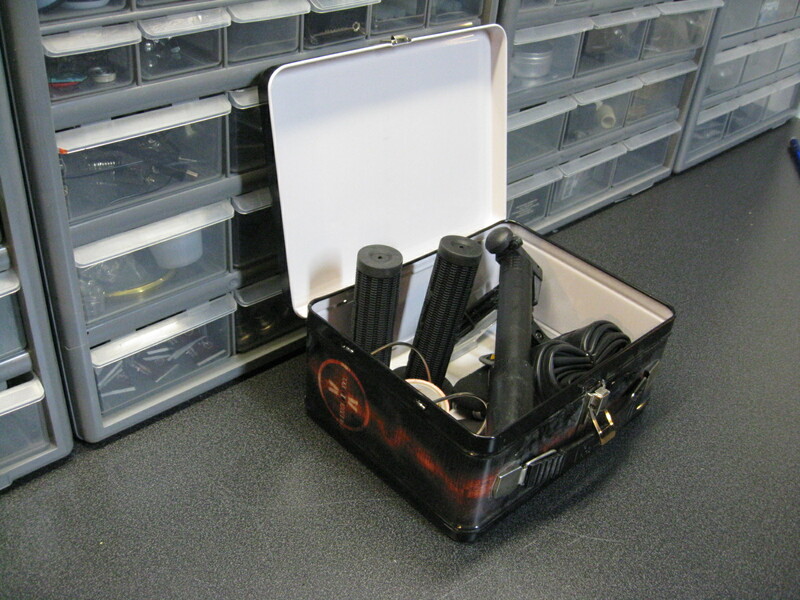 The X-Files lunchbox, which had been a $0.25 find at one of Connecticut's wonderful and unpredictable tag sales, was the trusted spot for all remaining parts for the project; save for the handlebars. I had also bought a triangular frame bag and had already picked out mountain bike specific tools and other things that would stay with the bike at all times. 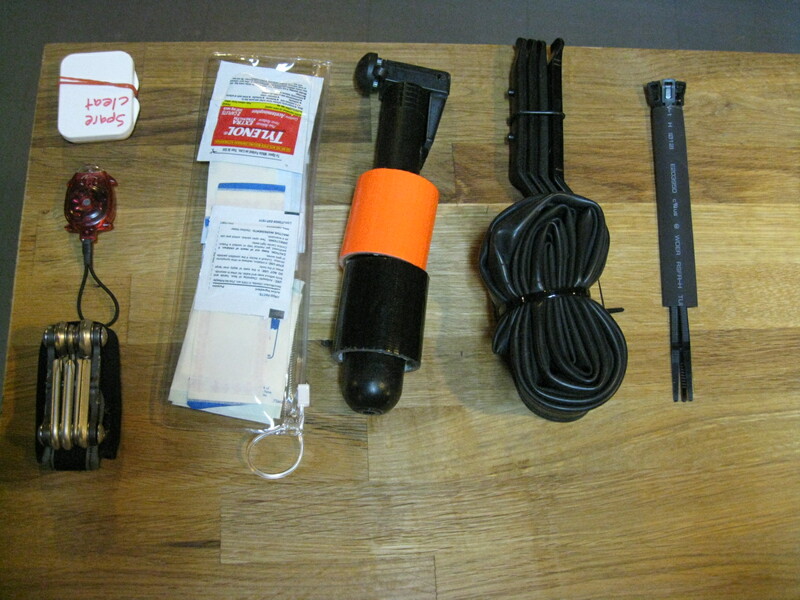 As you can see, this mountain bike will travel with a mini tool, an abbreviated first aid kit, one small black roll of duct tape, one small bright orange roll of duct tape, four tire levers, a mini red blinking light, a spare 26" tube and some reusable wire ties. Reusable wire ties come in useful if, for instance, a screw holding your rear rack comes loose on a ride. This mountain bike has no rear rack, but I'm bringing wire ties anyway. I also threw in a spare cleat for my bike shoe, as I know that if one screw comes loose a day of biking can be ruined (but if I come across any DIYbiking.com reader on a trail who needs a spare cleat, consider it yours). The duct tape, naturally, needs no introduction. If the fender comes loose or a piece of Velcro on my shoe comes off, black duct tape will work in a pinch. Bright orange duct tape, on the other hand, can be used in a survival situation. I'm sure Bear Grylls could explain the uses of it better and more breathlessly than I could. When my carbon fiber handlebars arrived in the mail, I was in for a bit of a shock. They were wide. Really wide. Difficult-to-pull-the-bike-through-a-door wide. I had visions of trying to keep up with my cousin but becoming wedged between trees every fifteen or twenty feet. I'm not sure if it was the safest thing to do, but I used a pipe cutter to cut the bars shorter. I lopped off about half an inch, decided it wasn't enough, and then I lopped off some more. The handlebars looked just as strong as they did before, only they were shorter, which was the result I was aiming for. 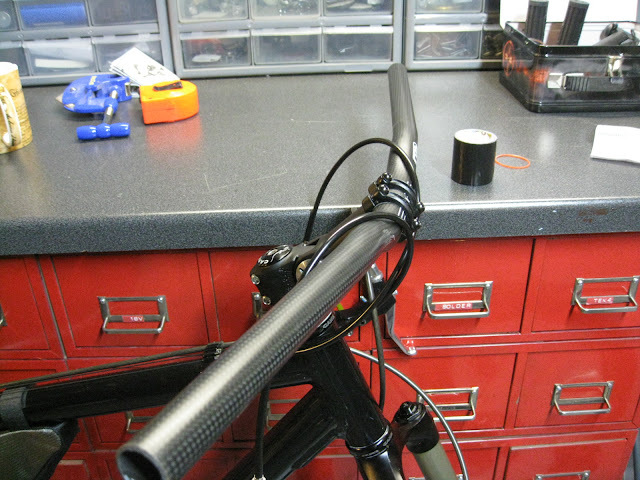 The stem I bought was a Nashbar Adjustable Stem so I could adjust the pitch of the bars as I wanted. The only issue with that was it was hard to stop adjusting it. I likened the experience to a rental car with electrically operated seats: you spend more time looking for the most comfortable position than actually being in a comfortable position. Still, after some trial and error, I had the bars in a comfortable position. Next, I slid the brakes and the shifters on, and then I pushed and pushed and pushed and pushed and pushed and pushed and pushed and went to the office to go to work and then I came back home and pushed and pushed and pushed and pushed and pushed and pushed and pushed and pushed and pushed the handlegrips on until they were in position. 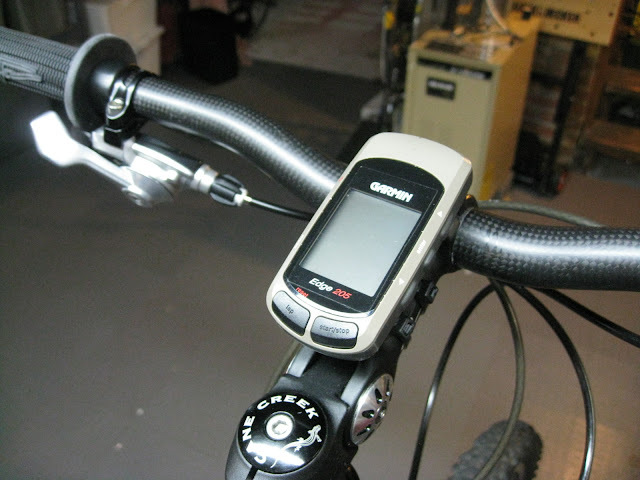 Finally, it was time for the last piece: a mount for my Garmin Edge 205. It goes on the recumbent. It goes on the Dahon. It goes in a Ziploc bag when I go kayaking. I even have an extra mount with two reusable cable ties to use with rental and rescue bikes. You can bet it will be found on the Untitled Mountain Bike Project. And it was done so fast I hardly realized it. Several glorious weeks of building a bike from the ground up was the most satisfying time spent in the shop, and I do recommend this for everyone. I got on and pedalled from the clothes washer all the way to my welding room. The front derailleur wouldn't shift, so it was time to put a now finished mountain bike on the workstand and make some adjustments. Hi, first of all, i've been reading your blog for hours. It seems you are trully a bike lover, but haven't achieved as much bike knowledge as other bikers have, whom don´t seem to love bikes as much as you do. So, keep going, you are doing great. And that's what inspired me to write you (passing you just a tini tiny piece of knowledg). What i want to give you is a little tip for installing and removing handgrips. Next time you have to install rubber grips, try moisturising the inside of the grips and also the handlebar with alcohol (etanol). They will slide lick butter, but once the alcohol dries, they won´t move. Other people uses detergent (just a drop). 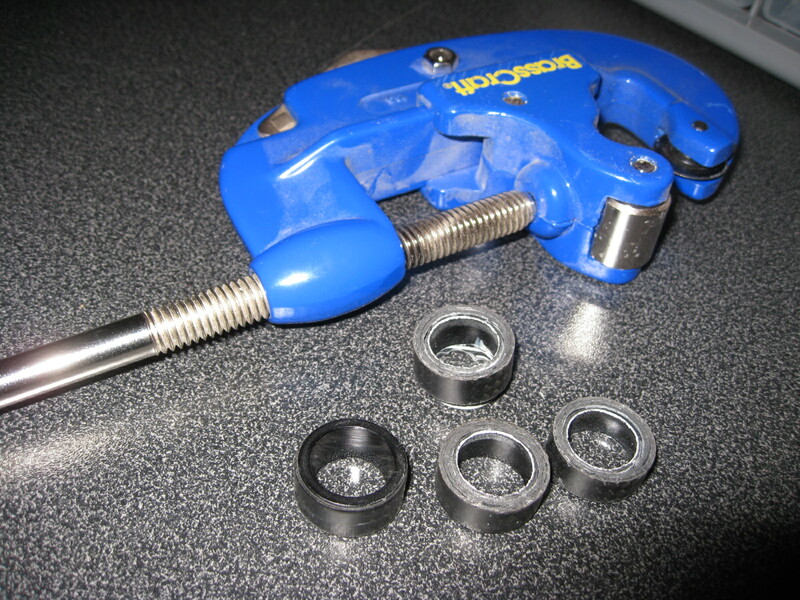 And for unistalling them, you can use a tooth pick or those plastic zips (you called them wire ties) to separate de grip from the handlebar and apply drops of water or alcohol and start moving the grip in a rotational direction. Keep doing this until the whole grip losses up, and then, it will go off like a charm. Well, that's all. I hope this was helpful, and please, excuse my english. Keep pedaling, keep posting, and keep being such a good citizen. Greetings, from Argentina. And spread the message, you and me live in a continent called America, you in the north part, me in the south part. We all are "americans". But in my case, i'm argentinian, so people from USA should be called... Just don't know...hehe.